TRADER 9: Trade of the day, GPOR!!! Trade of the day, GPOR!!! Caught an easy fear selling on GPOR this morning. Went long 300 shares at 38.25 after the candlestick hammer bar formed on the 5-minute bar chart. Placed a stop at 37.49, and was looking for a profit target of at least 40.95. But after GPOR broke through 40 dollars a share, I just decided to sell it, and take my profits now instead of hoping for it to hit around 40.95. 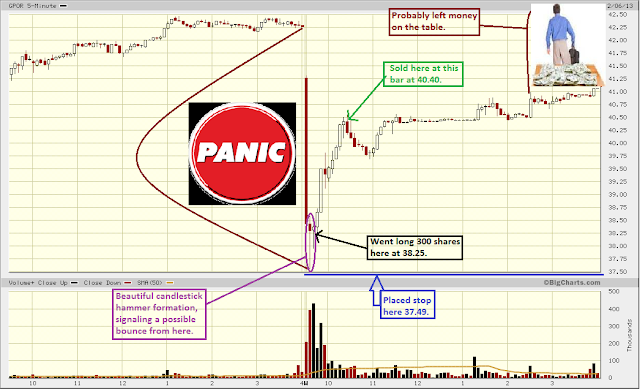 So for that, I sold GPOR on the next 5 minute bar at 40.40 a share for a 2.15 point profit. Trade of the day, AH!!! Trade of the day, MMSI!!! Trade of the day, NTGR!!! Trade of the day, NOG!!! Trade of the day, CLSN!!! Trade of the day, AKAM!! !